NJ prosecutors have a zero tolerance policy when it comes to illegal guns. 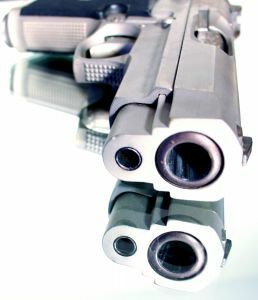 As a result, anyone convicted of a weapons offense in New Jersey faces significant penalties. Even if you have never been arrested or convicted of a crime, you could be looking at mandatory prison time for Unlawful Possession of a Weapon. That’s why it is crucial that you have an experienced attorney by your side and fighting on your behalf. The attorneys at the Tormey Law Firm have represented countless clients charged with weapons offenses in Essex County, NJ, including Millburn, Nutley, and Verona. The firm’s founding partner, Travis J. Tormey, previously worked with the United States Attorney’s Office, as well as two of the largest law firms in the State of New Jersey. Additionally, our criminal defense team includes a former county and municipal prosecutor, which gives us a major advantage when we represent you because we understand how the prosecution will structure their case. You can bet that the prosecution is already building a strong case against you, so do not wait to contact us about your weapons possession charges. Call 201-654-3464 to speak with a member of our litigation team. Although possession of a gun constitutes the most serious violation of the statute, possession of any prohibited weapon can lead to severe penalties. Additionally, NJ prosecutors and judges tend to interpret the statute very broadly so that just about anything – a knife, a slingshot, or brass knuckles – can constitute a “weapon” under the right circumstances. Generally speaking, Unlawful Possession of a Gun will result in third degree felony charges. This means that you will be subject to a sentence of 3–5 years in New Jersey State Prison if you are convicted. Possession of any other kind of weapon, such as a knife, is typically classified as a fourth degree felony. A conviction will expose you to up to 18 months in state prison. New Jersey lawmakers do not mess around when it comes to guns and public safety. That’s why anyone convicted of illegally possessing a firearm will also be subject to strict sentencing guidelines under the Graves Act. This statute really limits the prosecutor from exercising any sort of discretion in gun cases because it requires the judge to impose a minimum sentence of 3 years in prison. The only way around this strict penalty is to secure a Graves Act Waiver for any plea deal; however, doing so requires both the prosecutor and the presiding judge to approve the plea agreement. The Tormey Law Firm is prepared to fight your weapons charges and keep you out of prison. Call us today at 201-654-3464 to speak with a member of our criminal litigation team, or email us to schedule a free consultation at our office in Newark, NJ.